I have heard of the chocolatier before, but it was only when I did a quick search online, then I knew that he holds the prestigious title of Belgian Chocolate Ambassador along with other awards. Anyway, back to Jean-Philippe Darcis at MBS. The chocolate cafe sells pralines, Belgian Waffles, Cupcakes, and an assortment of macarons (around 14 flavours to be precise). 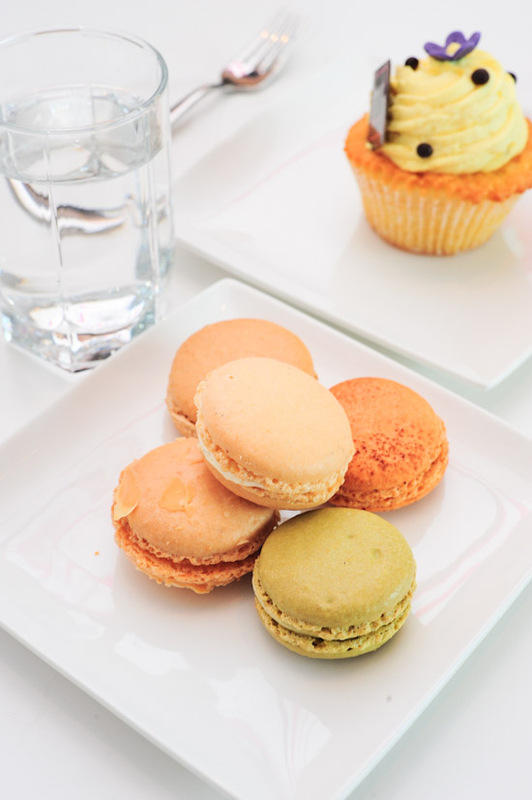 At $3 per piece, the macarons are not exactly cheap. But still, no one can resist macarons. Death by macarons! Death by macarons! We were debating if we should get a dozen macarons, but our common sense told us otherwise. We ended up getting 5 macaron (Almond Milk, Passion-fruit chocolate, Pistachio, Vanilla, Hazelnut) and a passion-fruit cupcake (a little dry). Among the ones that we had, my favourite was the vanilla and hazelnut. We thought that the Pistachio was lacking in the nutty flavour, while the Almond Milk and Passion-fruit chocolate were decent, but not life-changing. Do they have the best macarons in Singapore? Well, the macarons at Jean-Philippe Darcis are definitely some of the better ones that I’ve had. But I am not sure if it is the best. There are after all, so many patisseries and cake shops in Singapore. This gives me the perfect excuse of doing a taste-test of all the macarons in Singapore, but that’s a separate story. All in all, Jean-Philippe Darcis at Marina Bay Sands is a nice place to have Belgian waffle, macarons and a cup of tea. It is not as popular as the chichi TWG Salon (yet), so I will definitely go back and try the other macarons.